Mahindra Two Wheelers Limited (MTWL), a group venture of Mahindra and Mahindra has launched an exciting campaign on social media for its latest bike, the Mahindra Centuro. Packed with a bunch of cool features like Remote Flip Key with Key Light, Guide Lamps, Anti-Theft Alarm, it also includes India’s first Find Me Lamp feature in bikes that help you to easily locate your motorcycle even in crowded parking lots. The online campaign has been conceived with the idea to promote these features to the young target group, the ones who are social media savvy and gaming enthusiasts too. Mahindra Two-Wheelers teamed up with WATConsult, a digital and social agency, to gamify each of these features for an informative yet entertaining experience for the potential customer. So I had to begin playing right away! There are a total of six games, each highlighting six ‘wow’ features of the Centuro, and can be played on both the Mahindra Centuro website and the Mahindra Motorcycles Facebook page. I started with ‘Mission Ignition’ on the website. You need to press and hold the left click on your mouse to light up the Key Torch and move over the ignition floating around, all before the battery dies down. This was to highlight the Remote Flip Key with Key Light feature which is a first on any bike in India! With a bad mouse pad, I couldn’t get around to play it well so stopped the game mid way. Next I played ‘Bike Seeker’ hosted on the Facebook app that has been inspired by the Find Me Lamps feature. Here you have to find eight bikes hidden in the different city landscapes. This is simple and fun, made up of levels and got me to ‘like’ the Facebook page before I could start playing. 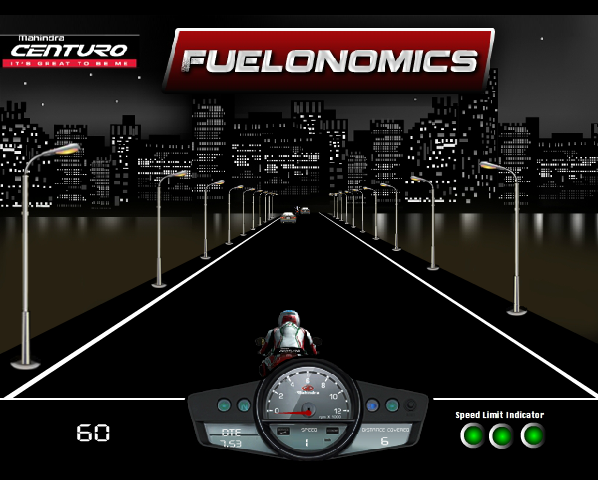 To highlight the Distance to Empty – DTE feature of Centuro, a rather demanding riding game called ‘Fuelonomics ‘ challenged a user to maintain his speed to consume less fuel. Hosted on a Facebook app, this game took me some time to get a hang of. Here you can use the arrow keys to accelerate your bike and keep away from obstacles, while collecting fuel gallons whenever DTE signals you are running out of fuel. For highlighting its advanced Anti-Theft Alarm, a bike stealing game called ‘Centuro Alert‘ is making car thieves out of us. Hosted on a Facebook app, you need to steal bikes on a busy road by clicking on them, while avoiding police vehicles and the Centuro bike. You lose a life if you click on a Centuro; remember it has an alarm! 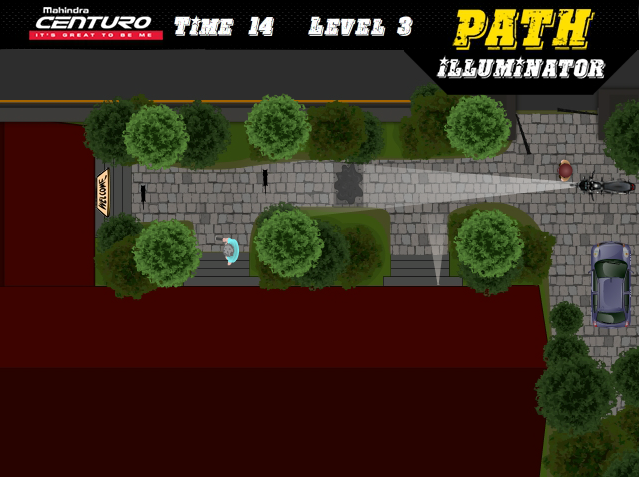 ‘Path Illuminator’ has been conceptualized to highlight the Guide Lamps. Hosted on this Facebook app, you need to get to your door on a dark night with the help of guide lamps before you run out of time. Use arrow keys to move but without getting spotted by a very vigilant grandma or hitting a cat. The space bar helps you jump over cement holes when you go up levels. The ‘Centuro Challenge’ simulates real city rising conditions to highlight the powerful MCi-5 Engine of the Centuro. Hosted on this Facebook app, the game requires some deft handling skills. Here left and right arrow keys help you maintain your incline, whereas up and down keys help you control forward and backward movement, and the space bar helps you jump. For all the games, you can share your scores on your Facebook wall or play again to improve it. A leaderboard displays the top scorers in each of the games. Cool prizes like tablets and gaming consoles added to the excitement. While Facebook has been largely about inviting potential customers to play the games, the 140 character social network, Twitter has been more about creating buzz with the help of engaging contests and youthful prizes. Very impressive! Gamification always provides for a deeper engagement with the consumer. The campaign works well in its objective to both inform and appeal to the youth by embarking on a gaming route via social media. The relevant incentives only add as a motivation to come back for more. Gamifying the different features to highlight them as opposed to providing an informative piece on each of the useful features of the Centuro, will certainly help in better brand recall, a larger online community and possibly sales. However, the Facebook apps could provide a link to the website or a link to encourage players to take a test drive of the new bike. The games have been well designed with a bunch of steps to play and messages on the way. Cool graphics and a fun concept for each of the features provides for a smooth experience for the player. The background score needs to have a mute button though. Interestingly, the motorcycle brand has also employed emerging social networks like Vine and Instagram for the Centuro. Check out this Vine video visually depicting the gaming challenge. Apparently, Mahindra Two Wheelers has gone all out with complete faith in the online medium. Hopefully, we see more brands with gamified concepts to sell on social.